Thurland Hall, Nottingham, in 1831. About the year 1652—there lived at Thurland Hall as an "upper servant" in the family of the Earl of Clare a very extraordinary person for his station in life, being an excellent scholar, well skilled in the classics, and possessing a very ready pen, He was Robert Loveday, who studied at Cambridge. He translated into English the first three parts of La Calprenede's "Cleopatra," which was issued as "Hymen's Praeludia," or "Love's Master-Piece," in 1652-5. In 1659 he published a volume of letters, which, like his previous literary work, was "in good esteem with the public and the literati of his time." The title of this epistolatory publication was "Loveday's Letters Domestick and Forrein. To several persons, occasionally distributed in subjects Philosophicall, Historicall, and Morall, by R. Loveday, Gent., the late translator of the three first parts of 'Cleopatra.' "By way of frontispiece is the author's portrait, executed by Fairthorne, a celebrated engraver of his day. Walpole, in his "Anecdotes of Painting," cites this as one of the finest works of the great engraver. Who Loveday—a handsome fellow—was is somewhat of a mystery. He is described as an " upper servant." In these letters no names are mentioned, which adds to the uncertainty of Loveday's personality. He refers to "my lord of Lincolne," and "my lord of Clare," and to Sir T. Pettus; and used initials very freely. These letters bear evidence that they were written for ultimate publication. From internal evidence in this work it is certain that Loveday—whatever his real name was, if this was an assumed one—was an ardent Royalist, that he had been in the army, was reduced in circumstances, and had been for several years in the service of the Earl of Clare, then Recorder of Nottingham, probably as private secretary. Writing to his brother, he said "I am now in Nottingham, perfectly settled with my Lord C. Myemployment is something too great for an unseasoned servant, and would discourage a new beginner, if I did not supply the defects of my experience with an active, pliant resolution. I attend him in his chamber, and usher his lady, write his letters, and whatever else that unbeseems not his command or my obedience. My wages are little enough to make present subsistence circumscribe my gains; but I think I have already a greater allowance of his love than his money." Deering mentions this Hall as a place for public use. 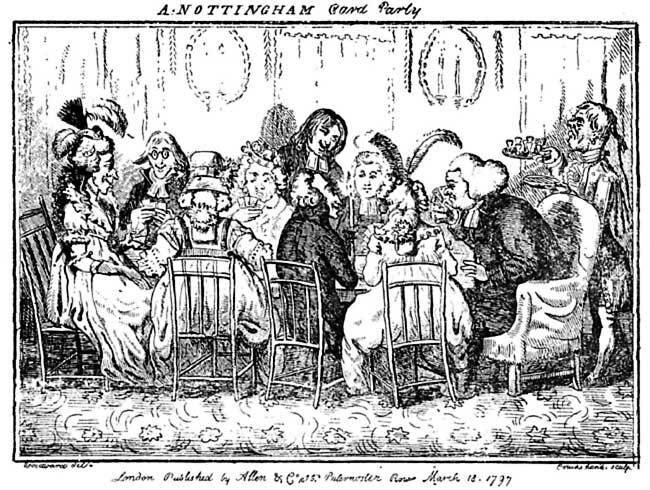 He throws light on the social life of Nottingham near the middle of the eighteenth century, and associates Thurland Hall with it, in these words:—"Two monthly assemblies contrived for the interview of the genteel part of the town of both sexes, where the younger divert themselves with dancing, whilst the senior or graver part enjoy themselves over a game of Quadrille or Whist. One of these places of meeting is on the Low Pavement. . . . This is called the Ladies' Assembly. The other, called the Tradesmen's Assembly, is held in a large room 70 feet long and 20 feet broad, where the wealthy tradesmen, their wives and sons and daughters, meet for this same recreation. This is at Thurland Hall in Gridlesmith Gate. The usual days of these assemblies are—that of the Ladies the first Tuesday, and that of the Tradesmen every third Tuesday in the month, when in the evening there is in both a numerous appearance. In both these places there are held Assemblies extraordinary, in the Assize week, Election time, and at the Horse Races." It was at a meeting at Thurland Hall, on March 4th, 1816, that the Bromley House Library scheme was floated, under the presidency of Mr. John Wright, of Lenton Hall. Dr. Storer took a very active part in this work. Laird, writing early in last century, states that by this time the Hall appears to have been reduced in area, and "to contain only two-thirds of the original plan, consisting only of a centre and one wing." The centre had "a double row of ornamental pilasters. The door of entrance is about 8 feet above the level of the street, with steps to ascend." The window frames were of "heavy stonework," and there were "semicircular zigzag pointed fronts to the roof." Inside the thickness of the walls reminded "the stranger of ancient dungeons; and the apartments, though spacious," were " extremely gloomy." At this time the great room was used as a banquetting chamber for the nobility and gentry of the county. Orange (1840) spoke of the "spacious lofty rooms" of the Hall, with the adjacent pleasure grounds, gardens, and outbuildings," as having been "admirably adapted for the residence of a large family of the first rank." Thurland Hall was described as "the largest and most ancient mansion in Nottingham. The Hall was a long, lofty, and gloomy building, with massive walls, and extended backwards to within a few yards of Lincoln Street. It was principally of brick, except the end fronting Pelham Street, which was ornamented by a double row of pilasters, and window frames of heavy stonework, with an antique entrance door, approached by a flight of steps, and semi-circular zigzag pointed front to the roof. It was originally built by Thomas Thurland, and was probably rebuilt and much enlarged by the Hollis', Earls of Clare, and afterwards Dukes of Newcastle, whose estates and titles passed to the Pelhams and the Clintons, by the latter of whom they are now held." In 1831, Bailey, in his "Annals," notes that the Old Thurland Hall and the adjacent buildings were demolished " after having stood through several centuries, and been at one period or another the abode of Royalty, and the scene of many gorgeous and expensive festivities. Several buildings were erected, as well as the street bearing its name formed, on the site."